This chair helps make the most out of your time and your practice space, with a compact design and memory programming that increases your efficiency. 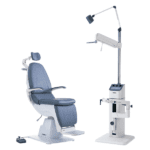 The S4OPTIK 2000 combo chair and stand unit provides a unique solution to the space vs functionality challenge, all at an affordable price. 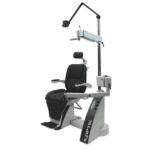 A small 44.8” (113.7cm) footprint provides total functionality in instrument delivery and patient comfort by combining features of the S4OPTIK’s Examination Chairs and the spectacular engineering of S4OPTIK’s instrument arms.